Intel Developer Forum (IDF) is an opportunity for the silicon giant to engage with its customers and partners, while showcasing what those companies are already doing with its technologies. A handful of flashy demos and initiatives captured the media’s attention: dancing spider robots, IoT solutions, wearables, a cancer-fighting cloud platform. Its Network Builders Fast Track launch might have been easy to overlook against this noise, but highlights its commitment to accelerating network transformation and the role it plays in SDN and NFV. Beyond driving its own innovations, whether or not the market needs another initiative to drive interoperability and use-case integration remains to be seen. If you only read about this year’s Intel Developer Forum in the popular technology blogs, you’d be forgiven for thinking it was like a mini-CES. It had wearables. It had IoT solutions. It had competitions for “makers.” It had robots – lots of robots. Despite their cute dance routines, it was a horrible place to be if you’re afraid of a future robot apocalypse. Even IDF’s keynote on 5G hit its fair share of popular tech notes including 4K video, connected cars, and drones. Yet, somewhere in the middle of all this was a launch that had almost nothing to do with consumer-facing 5G, and everything to do with supporting network transformation (including the evolution to 5G). Network Transformation. During the 5G: Innovation from Client to Cloud session, Sandra Rivera, VP and GM of Intel’s Network Platforms Group, unveiled the Intel Network Builders Fast Track program. A week later, Rivera led a webinar fully detailing the goals of the new program. (Full disclosure: I moderated and kicked off the session). While Intel Network Builders is a community of 172 partners building Intel architecture-based, open standards network solutions, the Fast Track program has three primary goals: optimizing solution stacks to take advantage of Intel technologies; working with Intel Network Builders partners to deliver integrated and optimized solutions around key use cases; driving multi-vendor interoperability thanks to compliance testing, benchmarking, and performance tuning. ROI. Intel’s interest in driving the adoption of its own technologies needs no explanation. The interest in driving integrated, optimized, interoperable solutions doesn’t require much more explanation. 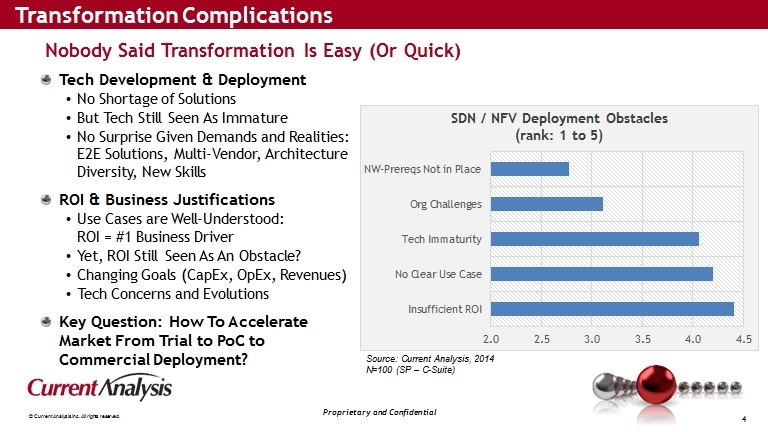 Network transformations like SDN and NFV are still in the early phases of commercialization, with concerns around technology immaturity seen as a major deployment obstacle. And while operators see the ROI associated with these technologies being the number one business driver, they also see questions around ROI – impacted by questions around the potential costs of integrating technologies and solutions which are still in the early stages of commercialization. Our own survey of 100 service provider executives bears this out; when we surveyed operator C-suites around SDN and NFV, ROI was the number one business driver, but also the number one deployment obstacle…followed closely by unclear use cases and technology immaturity. Accelerating the Market. Intel clearly isn’t the first company to recognize this problem. There’s no shortage of vendors which crow about the progress we’ve made at moving SDN and NFV forwards, while simultaneously attempting to accelerate these transitions. And, as a result, we have many diverse organizations – including the MEF, ETSI, OPNFV, OpenDaylight, ON.Lab, TM Forum…just to name a few – trying to play their part in moving the market forward via integrated solutions, multi-vendor interoperability, and similar efforts. The challenge, then, for Intel is to do more than offer up programs that COULD accelerate network transformation. It will need to show how its efforts are actually achieving those goals, giving operators a little faith in the ability of SDN and NFV to have a meaningful impact on their operations. 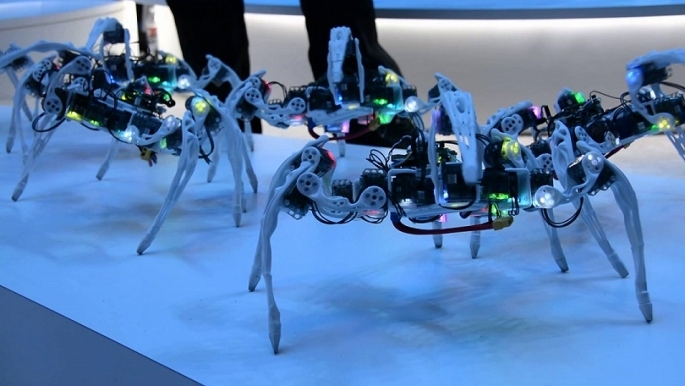 If it can do this, Intel’s in a position to make networks, as well as spider robots, dance.